I’ve listed other Blue Jasperware, if you are interested. Classic Greek image on lid. Cherubs on lower box. New York, New Jersey and Pennsylvania USA. For almost 40 years, they have not been seen nor touched. WEDGWOOD COVENT GARDEN DINNER PLATE, 10.25in. A Charnwood pattern coffee can & saucer in perfect condition, c.1960. 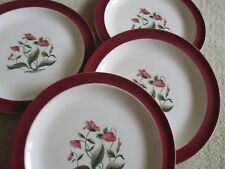 A set of 4 Wedgwood Patrician tea plates in the Morning Glory pattern. I have added to the four a larger plate suitable as a serving plate for a cake/sandwiches. Each plate has high relief mouldings around the edge and is finished with flower decoration to the centre. These side plates are in the popular Mayfield pattern are were made by the Staffordshire factory of Wedgwood (Barlaston, England) and were produced in the middle of the 20th Century (circa). WEDGWOOD - SET OF THREE DINNER PLATES - GREY BORDER. Light blue Jasper Ware. We fully understand that things can go wrong for a variety of reasons. Enoch Wedgwood 6" High Plant Pot Holder Bird And Flower Design Beautiful Vintage. Perfect condition and a truly beautiful item. Please be reassured by my feedback. Any questions please ask. Yellow Primrose Jasperware. Blossoms plus border of fleurs-de-lys. Decorated with sprigs of prunus blossoms. Raised white bas-relief. New York, New Jersey and Pennsylvania USA. For almost 40 years, they have not been seen nor touched. XXCMS ACROSS. UNLESS OTHERWISE STATE ALL CHINA AND GLASS WILL BE SOLD IN GOOD USED CONDITION. Wedgwood MOSS ROSE Oval Dish 10.5" x 8 1/4 "
Manufacturer: Enoch Wedgwood of Tunstall Staffordshire. Pattern: Countryside. A Wedgwood Patrician sugar bowl with gold highlights to enhance the pattern outline, in perfect condition with no gold loss. The underside has the Wedgwood Barleston logo in red. The bowl is stamped Wedgwood made in England. The bowl has been previously owned in very good condition and is first quality. Wedgwood CREAM COLOUR ON LAVENDER Dinner Plate. Diameter 10 1/4 inches. A Dinner Plate. Shell edge. Wedgwood - Queens Ware - Embossed - Blue on White - Dinner Plate - 10.5"
Made by Wedgwood. It is from their Queens Ware design. It is white in colour and is embossed with a blue coloured design. There is a pin head sized indent in the plate. Here for sale is a lovely and rare decorative plate. The jug holds approx. I try to describe everything thoroughly and as honestly as possible. A Wedgwood blue jasperware imperial bowl with pedestal base. The bowl is decorated with white bas-reliefs depicting sea animals including whales, turtles, seals and dolphins and the rim of the bowl features a wave pattern garland separated by a decorative shell. This retro design was introduced in 1969 and retired in 1986. PERFECT CONDITION. SORRY BUT IF THEY ALWAYS TREATED YOUR PARCEL WITH CARE & RESPECT I WOULDN'T HAVE TO WRITE THESE WORDS. SUPER QUALITY. Wedgwood ASTER Oval Meat Dish. Diameter 11 3/4 x 10 1/4 inches. Wedgwood ASTER. A white floral pattern on a celadon green background. Wedgwood ASTER Oval Meat Dish. Diameter 14 3/8 x 11 5/8 inches. WEDGWOOD - JASPERWARE. Produced in a variety of colours (the most celebrated shade being pale blue). Onto to these backgrounds white classical bas-reliefs or portraits were added. 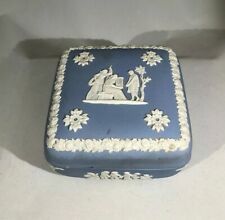 5: Covered Pot - 10cm high - Royal blue - 1977 Silver Jubilee - Queen Elizabeth II & Prince Philip Portraits. WEDGWOOD MOSS ROSE. An impressive piece of china. Wedgwood CREAM COLOUR ON LAVENDER Open Oval Vegetable Dish. An Open Oval Vegetable Dish. Excellent Condition. Wedgwood Calendar Plate 1979. Made in England. Titled " The Sacred Scareb". Sun God of ancient Egypt. Appears in the centre of the design with the wings of a Falcon encircled by Mandrake and Lotus Flowers. The backstamp says Wedgwood of Etruria and Barlaston. TWO Saucers. These are from the range, made in the 1960s the date is impressed into the ware. ONE Vegetable Tureen or Casserole dishno lid. From the Oven to Tableware range, made in the 1970s. Wedgwood CREAM COLOUR ON LAVENDER Soup Cup. A Soup Cup. Twin handles. Wedgwood MOSS ROSE. Dessert Salad Cake Plate.